Weekend Funnies ~ Bow WOW! I was driving along a side-street near my home. My pace was slow because I was only a few yards from the elementary school and because there were kids on bikes at the side of the road. It was a beautiful, spring day and my car window was down so I could enjoy the sunshine and fresh air. As I rolled by a car parked on the other side of the road, I noted a cute little blond girl-child, probably around 4 years old, kneeling in the driver’s seat. The driver’s window was down. The child had her hands curled over the window edge and head hanging a bit out of the car. As our eyes met she leaned even further forward and barked at me. She fell over backward. I distinctly heard her giggling. I was giggling, too. 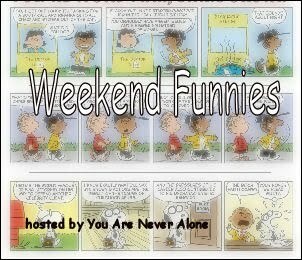 Because she wants us to laugh a little every weekend, Shakira of, You Are Never Alone, hosts the Weekend Funnies meme. Shakira says she doesn’t care if we tell our own tales or post some of those endless jokes that fill our email boxes. She just wants us to share a bit of laughter while visiting each other on the net. Check out Shikira’s blog for the other players and come laugh with us. I love those kinds of moments. Barbara — so do I. 🙂 Precious! I love the feeling I get reading your story! Betty — I love remembering the incident! Does one learn how to speak dog at a special college? LOL. Cute story. What kids will say to get adults to play along. Thom — I think if a 4 year old mastered it, you can probably learn to speak dog without college intervention. A tutor might be in order though. Ask Nalu for help. I love little kids. But then they grow up and become teenagers. SN — I even like teenagers. They can be cool — sometimes. My sister and I can talk with those animals too. Our spouses know when it is going to start. They look the other way! Jim — I went and read your friend’s blog. His funnies are funny, but he gets them pre-written. I write my own. This one actually happens to be true. Yea, Quilly, I know that. And his are corny while most of yours are cleverly written. You are a good writer. I was thinking of Shakira’s whose are prewritten. Not only that but those comic strips are copyrighted. In the four and a half years I’ve been blogging I have been asked to remove one post which was a widely circulated e-mailing. It seems it was part of a chapter from the asking lady’s book. I promptly removed it and appologized to her. YouTube also removed a song from my post which my daughter used in making the “There She Goes” video. It was of my grandchild, BP, igniting her rocket and chasing it down after it landed. good to have you back Quilly! Shakira — I am an elementary school teacher. I often act like a kid. It helps me communicate with them. And if her momma scolds her, she can say “I didn’t talk to strangers. I barked at them! Linda — yep. Of course, her momma needs scolded for leaving her alone in a car on a busy street — on the other hand, when I returned from my Avon delivery, I saw she was with her dad and her mom was nowhere in sight, so I should likely not be blaming mama. Ohhhhhhhh, how cute is that story!!!! I bet the little one will remember that for a long long time. You made her day. My Weekend funnies are posted now…hope you can stop by. Just scroll down below the bird photo and you’re there. Anni — Well, whether she remembers it or not, I will. It made my day, too! Wasn’t she lucky to find someone who knew how to play the game? ROFL! Jingle — I like playing with kids. Helen – -thanks. It was fun, too!